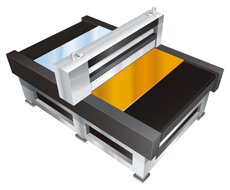 Coater/Developer SK Series | SCREEN Finetech Solutions Co., Ltd.
High productivity suited to TFT mass-production. Integrated system control throughout the line maximizes productivity and efficiency of movement between units. Linearcoater™ or Levicoater™ can be chosen for the coating unit. Completely automated coating nozzle maintenance enables continuous operations. The small footprint ensures effective use of limited production space. The evolution of the SK series has focused on the efficient use of resources. Conservation of resources supports environment friendly FPD panel production. Offering extremely stable coating performance for a mass-production coater, the Linearcoater™ is incorporated into our SK and SK-N series of coater/developers and has gained the top share in the global market for large-sized TFT arrays. With the slit-type coating system, the efficiency of resist usage is almost 100%. SCREEN's unique slit nozzle design enables superior coating uniformity even when coating large substrates. High-speed coating suitable for today's increasingly large substrates. A two-nozzle coater is available for production lines that use multiple types of coating material. 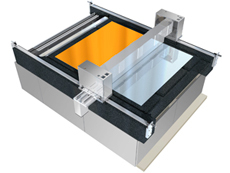 SCREEN is exploiting our Linearcoater™ coating technology for use in levitation transfer systems, and have achieved even greater productivity by incorporating that into our SK series coater/developers as well. Tact times have been further reduced, greatly increasing productivity for large-size substrates. Substrates are not held on the stage by suction, preventing particles from attaching to the rear side. Substrates are transported by levitating them on air, reducing static electricity. * Linearcoater and Levicoater are registered trademark and/or trademarks of SCREEN Holdings Co., Ltd.